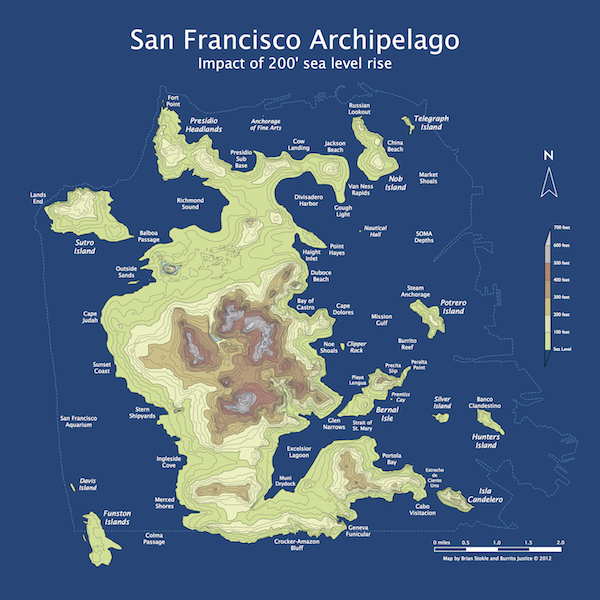 Responding to coastal erosion due to the accelerated disintegration of the East Antarctic ice cap, the NCCS (Northern California Coast Survey) has released a higher resolution topographic map of the San Francisco Archipelago, showing the 200 foot sea level rise compared to the 2012 sea level datum. This poster, designed by centenarians Brian Stokle and Burrito Justice, is available in three sizes (note: adjusted to 2012 dollars, and old-style American measurements – please double-blink to convert). Note this should not be used for navigational, construction or underwater recovery purposes. Additionally, the hydrographic map has been delayed due to budget restrictions due to the construction of the new Norcal Capitol building on the Fresno shoreline. However, a small segment of the street map update is available for review. The new street maps will be released by neighborhood over an indeterminate time frame. Noe Shoals residents vow to stop any port in their area bigger than a 40 boat small boat/fisherman fleet marina. Bernal Isle residents bemoan the design of the Cortland-Chernery street bridge, and worry that the influx of new visitors will threaten the “unique” character of the island. Debate over where to build new container port continues — Geneva/Muni Yards or Divisidero Harbor? Lawsuits continue over the ill-conceived levelling of San Bruno Mountain to 150′ in 2045. The Board of Supervisors agreed to extend Twitter’s tax break if they build their new 110 storey corporate headquarters on the disadvantaged Nob Island. Sea trials of the NCSS Ed Lee continue out of the Presidio Sub Base. The first of the Sutro-class algae-diesel attack subs is expected to contain the southern incursions of the Vancouver Island-Cascadia Alliance and neutralize the Orange County drone fleet to Port Fullerton. New legislation lifting restrictions on taco boats is expected to be approved by sailing season. The bond measure for a new multipurpose floating sports stadium anchored on Alcatraz is expected to fail in next week’s referendum. Meanwhile, the 49ers consider a move to Santa Cruz. A new study has revealed that the on-time statistics for Muni’s fleet of sea buses have been exaggerated since 2064 — average speed is 20 mph, not 20 knots. 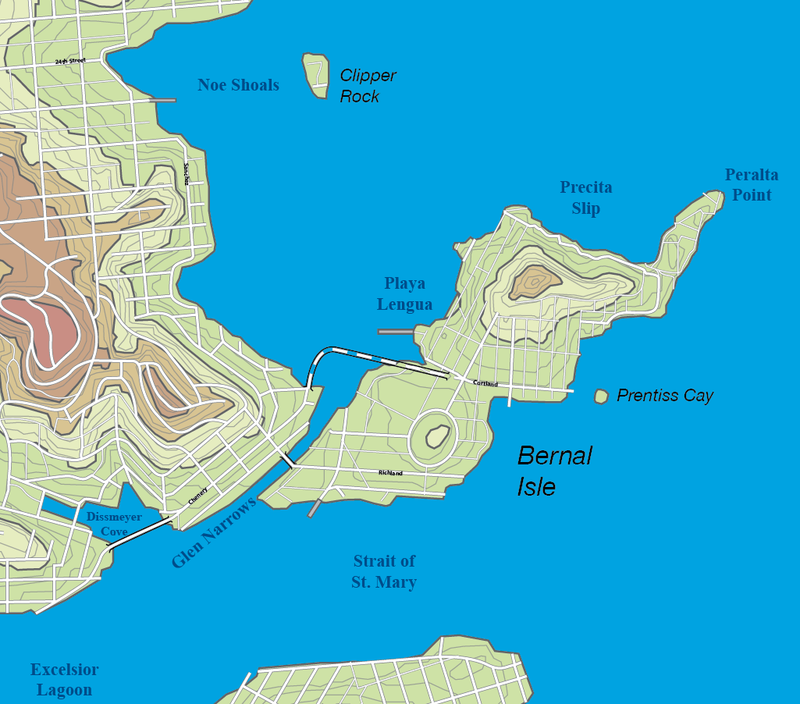 120,000 years ago, SF Bay was 20 feet higher than today. 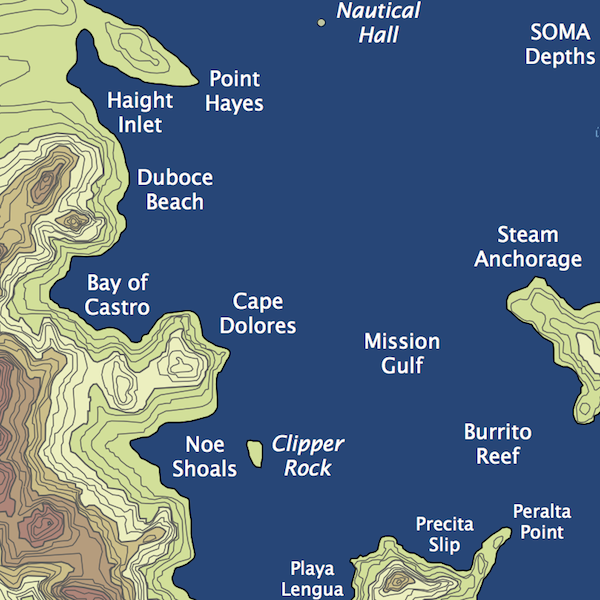 125,000 years ago, San Francisco was actually an island thanks to the Colma Strait. More here. The good news is that hipsters may finally become acquainted with bathing. Take your stinking paws off me, you damned dirty apes! He hasn’t taken into account erosion of soft material due to tidal/storm surges. Once any non-bedrock structure is removed you get bays and harbors where deep alluvial fields once occupied the geology. I’m trying to think of how this would be a bad thing. I live in Sacramento. Should I buy a surf board? You might need to get a boat if you live in Sacramento. Or move up to Folsom or Auburn. The 200′ shoreline would lap at historic Sutter Street in Downtown Folsom. In fact, the light rail station would be under water, but Sutter Street would be the shore. Going into town, Sutter Street is above 200′ from Decateur on eastward. Fair Oaks, esp. historic Fair Oaks would be a series of islands. Even part of the Sunrise Mall would remain above water as a testament to the 20th Century. If Folsom’s not your thing, and you’d rather move to an established city, there’s always Fresno at 300+ feet or you could move to Chico, which would have a new harbor right in downtown. You should smile or wink when you say that Brian, otherwise people will think you’re a moron. We’ll really find out how well downtown is built, when the waves start crashing on Montgomery. It might be the domino effect in slow motion. It will be fun to tie your boat up to Transamerica Building to watch. I want to move to San Francisco, this really bummed me out.